XINDA Huge Screen Video Projector comes with 3 years of warranty on service and professional customer service and technical support. This is a high brightness Xinda projector that is considered 42.3 brighter than normal LED projectors. It delivers clearer color result when you watch TV or play games. This Xinda mini projector is perfect for home theater but it is not made for PPT and business presentation. Further, it gives large viewing area of 30 to 100 inches. The best projection distance is between 4 to 7 feet with 60 to 80 inches size. Also, XINDA Huge Screen Video Projector is made in a portable design that is very easy to take and travel. It can also be the best gift for children. 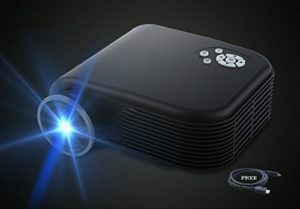 Amazingly, it supports most of the input methods such as HDMI, USB, AV, SD, VGA so that you can easily connect this video projector with most devices including personal computer, laptops, DVD players, USB disk. Please make sure that the USB port is only for U-disk/hard disk devices. Also, to prevent overheating, it can be good if you avoid using after every three to four hours.